(From left) Métis Child and Family Services executive director Don Langford, Family Information Liaison Unit staff member Janice Randhile, Indigenous Relations Minister Richard Feehan and Health Minister Sarah Hoffman. 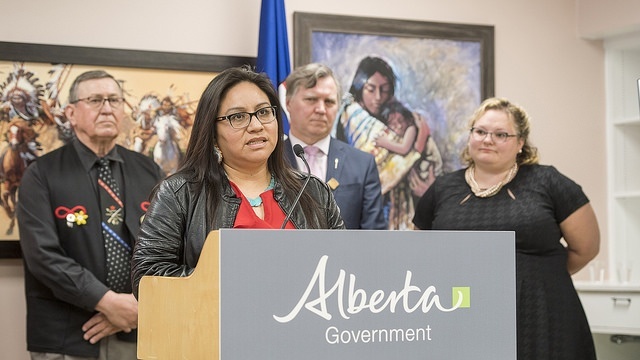 “(The unit) is designed to be a culturally-relevant, one-stop support service and information source for the families of murdered and missing Indigenous women and girls.” ~ Alberta Indigenous Relations Minister Richard Feehan. Don Langford says the creation of a Family Information Liaison Unit by the province is an indication that the government “gives a damn.” The unit will interact with and support families of murdered and missing Indigenous women and girls. “There is a great need in this community for someone to step up and listen to our people, to understand what they’re feeling and to understand their frustration. You can’t go day after day and ask question after question without getting some sort of illogical response from somebody. “At times our people feel that just nobody gives a damn,” said Langford, executive director with Metis Child and Family Services. Langford was part of the province’s announcement, which took place at the Metis Child and Family Services office on May 19. The province is accessing $1.5 million from $11.7 million set aside by the federal government last August for the provinces and territories to establish units across the country during the National Inquiry into Missing and Murdered Indigenous Women and Girls. It took time to determine how to move forward, said Indigenous Relations Minister Richard Feehan, because the province had to ensure the funding was available. But more importantly, he says, the government needed to consult with Indigenous families to determine how best to serve them. Three of the unit members will be stationed in Edmonton and one in Grande Prairie. However, Feehan stresses, members will visit families in their own communities. All members are Indigenous and experienced frontline workers who have been serving Indigenous communities. The unit also has an Elder advisor, who is in the process of establishing an Elders’ council, which will advise on culturally-appropriate supports. “(The unit) is designed to be a culturally-relevant, one-stop support service and information source for the families of murdered and missing Indigenous women and girls,” said Feehan. The unit aims to eliminate obstacles families often face when seeking to learn information about the status of fatality inquiries, police investigations or criminal prosecutions. The unit will work alongside the national inquiry but unit members will not be included in inquiry hearings. Feehan says he does not know when the inquiry will get underway, only that his government is committed to cooperating, noting that last September an Order in Council was approved enabling the commission to access relevant Alberta records. “We are working with the federal government to encourage them to move this process ahead in a timely way,” said Feehan.